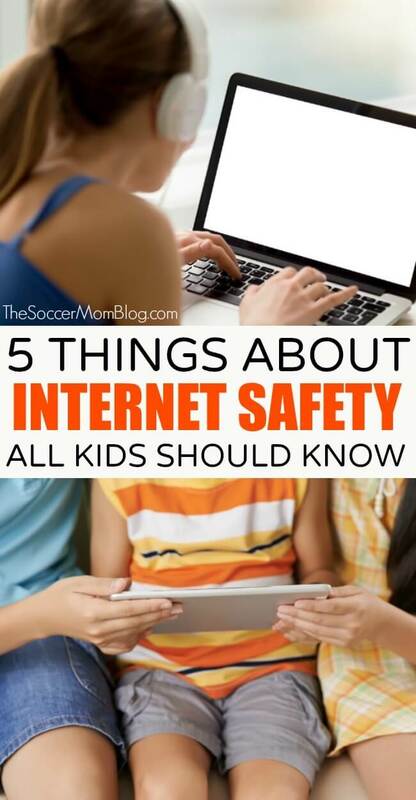 Do your kids know what they should about internet safety? Keep reading to learn the 5 keys to keeping your kids safe online and how to download your free family guide from Google for Education. We received this sponsored opportunity from Google for Education as a part of the Forward Influence Network. We are grateful for partnerships like these! I’ve been an internet enthusiast since its earliest days — I built my first website at age twelve! Little did I know that as an adult I would build my own business using the internet too! As a blogger, the internet provides me and my family with amazing opportunities. However, as a parent, I also see things that worry me — issues that I didn’t have to worry about as a kid. Picking up my oldest daughter from elementary school, I’m always surprised to see how many kids have cell phones. My daughter tells me that many of her classmates already have social media accounts too. Cyberbullying and “catfishing” weren’t even in my vocabulary in fifth grade, but these are things that our kids deal with on a daily basis. The internet isn’t going anywhere — if anything, it’s becoming more intertwined in our lives. There’s no way to avoid our kids using the internet, nor do I think that’s a good idea either. As I mentioned, the internet has been such a blessing and inspiration for me. The key is to start teaching our kids about internet safety as soon as they’re old enough to know what the internet is. Safer Internet Day takes place in February each year; this year it was February 5th. 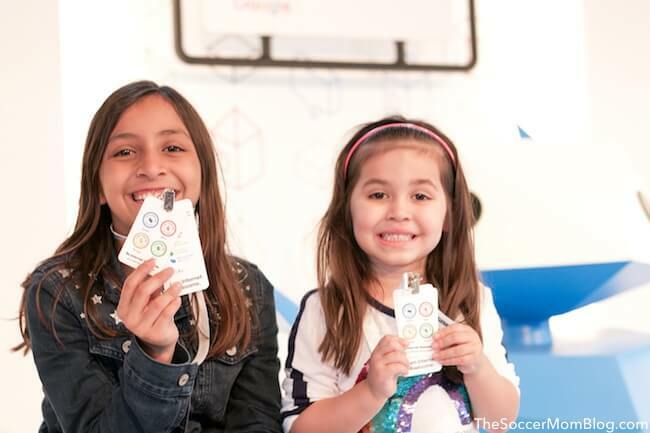 Google invited our family to nearby San Antonio to visit their Be Internet Awesome adventure — and interactive experience filled with resources to teach families and schools about internet safety. Just because we can talk to anyone and everyone on the internet doesn’t mean that we should. Kids were given an example scenario and asked with whom they could share that information, like a photo of a new baby cousin. Should they share this with everyone? Friends and family? Keep it to themselves? Once you got three answers correct, you earned your first badge and got to move on to the next game. Test Your Skills: Practice asking your kids similar questions at home to test their knowledge. You can also play the free Interland Online Game from Google, which teaches kids about what to share (and not to share). My girls love this game! As a blogger, I receive countless phishing emails, schemes, and scams every day. Some of these scammers are getting quite sophisticated that I even I do a double-take to make sure that an email is real before opening anything! If these internet crooks can fool adults, then kids are especially vulnerable. That’s why it’s especially important to teach kids how to determine what’s real and what’s fake. Even though our girls only have limited screen time, and always in the same room with us, you can never be too careful! I’m a realist, so I know there will be times when they are older that we might not be around (school, friend’s house, etc.) to catch things right as they happen. In the “Be Internet Alert” game at the Be Internet Awesome Experience, kids were given sample online messages and asked which ones were real and which were fake. The emphasis was to always be alert and on the lookout for anything that seems sketchy. My middle daughter is four, but I still didn’t leave her out of the conversation. For now, I simply repeated the message: “Don’t click any links!” Hopefully that will stick in her mind, and as she gets older she’ll remember mom’s advice! The third game at the Google Be Internet Awesome experience taught kids how to create strong passwords. 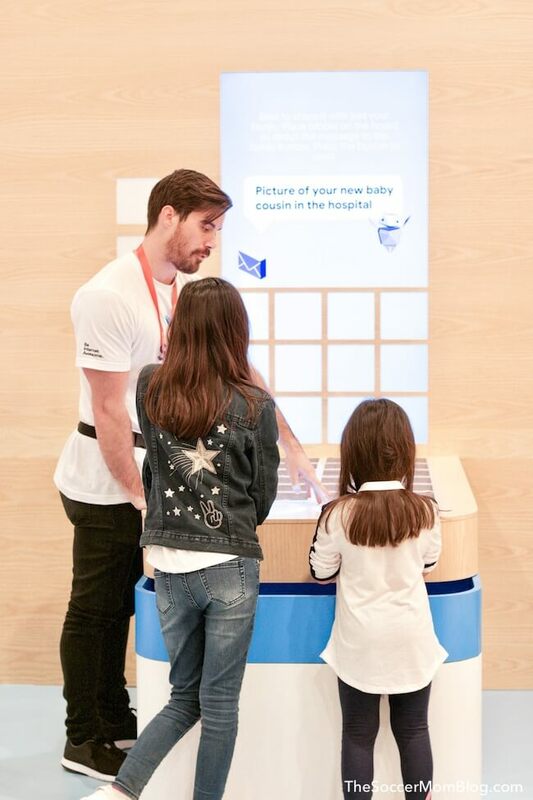 There were bins full of letter blocks and kids got to build passwords out of the physical blocks, and then test it to see if the password they created was strong enough. This was my favorite game of the day, and also the most challenging! It wasn’t hard to create a tricky password — the tricky part was remembering the password when the game prompted you to re-enter it from memory! Strong, secure passwords are vital to keep private information safe. Did you know at least one-fourth of students report experiencing bullying? Chances are, your kids will witness bullying — whether it involves them personally, or a classmate. The fourth internet safety lesson we learned focused more on being proactive: spreading kindness online. Through an digital multiplayer game, the girls and I teamed up to build each other up by shooting hearts at each other (spreading kindness) and taking down monsters (reporting bullies). It’s important for kids to know that they play a big role making the internet a more positive and safe place! A few months ago, I partnered with Google to host an event in Houston for parents, influencers, and educators. Together we brainstormed ways to keep kids safe online. The number one thing I heard over and over again was to be involved, be present, and keep the lines of communication open with your kids. 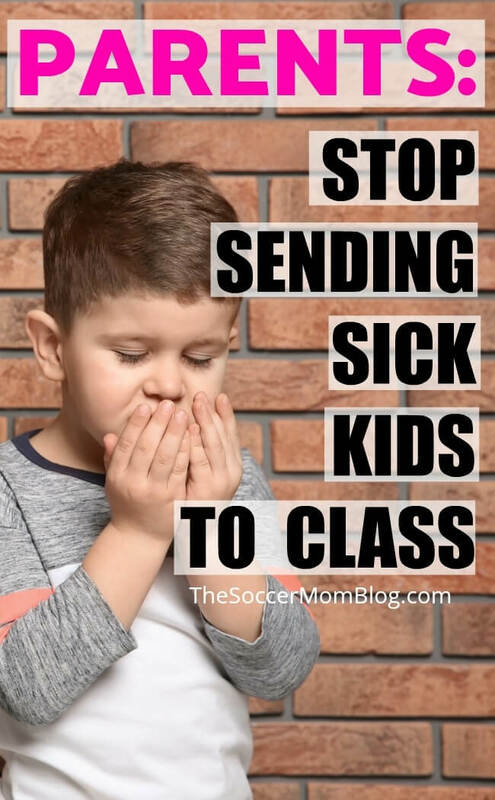 That way kids will feel comfortable coming to you with questions or problems. You can’t prevent your kids from ever running into something bad on the internet, but you can prepare them. The most important thing to emphasize is that you are there to help. Kids need to know that if anything feels “off” or if they see any other their friends in trouble, they should always come to you or another trusted adult. Mission complete! The girls were proud to earn their Be Internet Awesome badges! 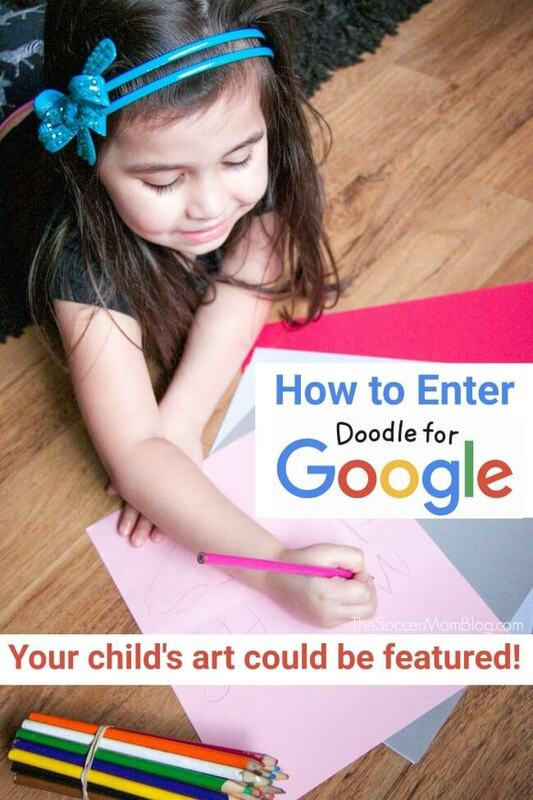 Google created an amazing online resource for parents and families, with lots of free information, games, and even crafts to help kids learn about internet safety — and have fun at the same time! Teachers: On the Be Internet Awesome website, there’s also a free curriculum you can use to teach your students! If parents and teachers work together, we can increase the chances that kids will experience all the best that the internet has to offer. 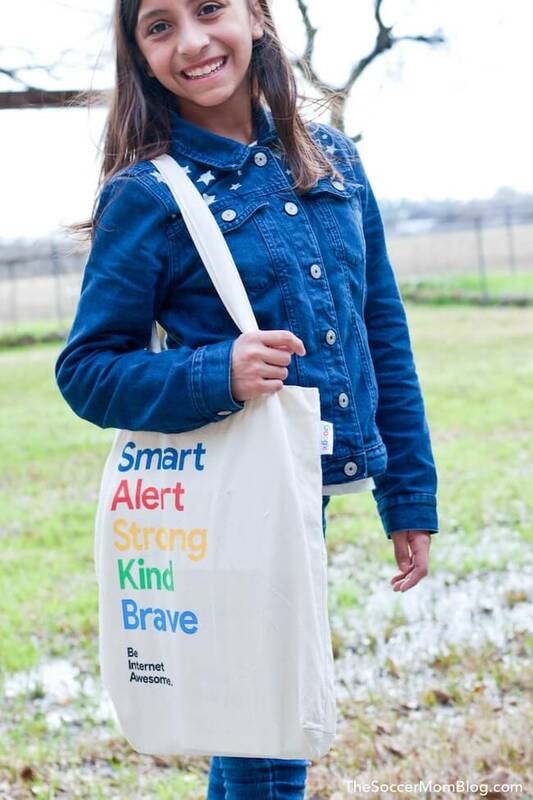 Click here to learn more about internet safety and get your free family guide from Google! Such great advice! It’s a whole new world navigating kids and social media. It definitely is! Social media especially – our kids don’t have accounts yet, but someday that’s going to come up I’m sure! These tips are so helpful. I’m always pondering the best ways to manage internet and tech use for my kids! Thanks for sharing! We’ve had lots of conversations that once you put something out on the internet it will remain there forever. Love the tips you shared. Thanks for sharing these tips. Our kids loved that game… I even enjoyed it too. I love that this information is age appropriate for so many ages. So true! My oldest girls are 5 years apart, but they both enjoyed the Be Internet Awesome program and Interland game! Great tips!!! The internet is so scary to open up to kids. Not looking forward to this part of parenting!! Aww, I know you will ROCK that part of parenting too! Yes!! I love the Google Be Internet Safe programs! They are so much fun for the kids and very informative! The world is so different than when you and I grew up! We got the internet when was in 5th grade and our whole family had like 20 minutes for the entire month! I’ll take all the tips and tricks! My oldest is 5 and I know this is right around the corner. Thanks! Yes! You’d be surprised how soon all this comes up – especially with friends and classmates.